Map of the State of New York Compiled from the Latest Authorities. 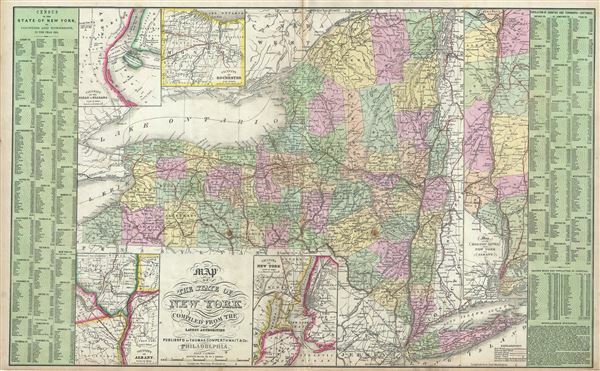 A fine example of Thomas Cowperthwait and S. A. Mitchell's 1854 map of New York State. The fact that this is one of only two double page maps in Mitchell's New Universal Atlas testifies to the importance of New York in the mid-19th century. Covers the entire state from Lake Erie to the Connecticut Vermont border and from Canada to New York City. Steamboat and railway routes throughout the state are noted. Five insets highlight Niagara Falls, Rochester, the vital New York City - Albany corridor, New York City's environs, and the vicinity of Albany. To the left and right of the map proper statistical data from the 1850 Census is arranged in tabular format. Political and topographical features are noted and color coded with elevation rendered by hachure. This map was prepared by S. A. Mitchell for publication by the Philadelphia firm of Thomas Cowperthwait and Co. in the 1854 edition of Mitchell's New Universal Atlas. Very good. Minor wear and toning along original centerfold. Some spotting at places. Minor verso repair near bottom margins. Rumsey 4328.014 (1855 edition). Phillips (Atlases) 6118.